41% reduction in water use below code maximum. 25% of the residents in the complex have access to secure bicycle racks and storage spaces. 53% reduction in lighting power density. 100% of the adhesives, sealants, paints, coatings, and wood products are low-emitting. Built in 1974, Soldiers Field Park Building 4 is a three story multi-family building which houses 47 residential units within a total of 43,110 square feet. The primary goal of the Soldiers Field Park Building 4 project was to renovate the existing building and surrounding site. Upgrades include all parts of the interior, including several different layouts of the residential units, and a more practical and aesthetically pleasing exterior site plan. The renovation also included mechanical, lighting, power, landscape, envelope and plumbing upgrades. This is the first phase of a four-phase construction project to upgrade the entire Soldiers Field Park residential complex. The project team was committed to sustainability from the onset. 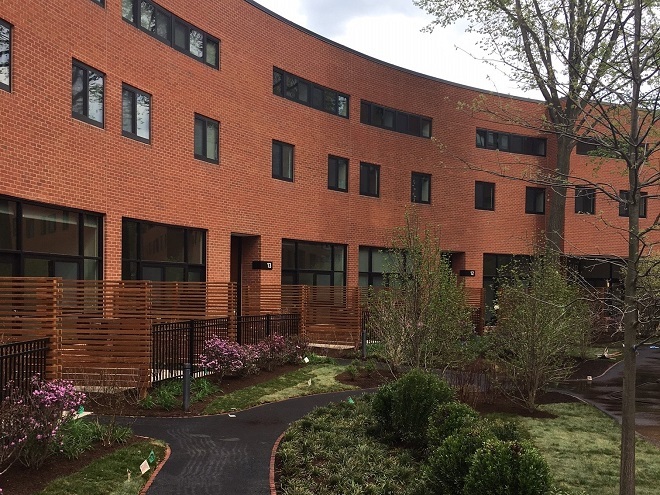 By following the Harvard Green Building Standards, the team was able to make more informed decisions and focused on including healthier building materials. These standards led to the inclusion of a number of progressive design strategies to meet aggressive energy targets, reduced water usage, and allowed the team to provide healthier interiors for the occupants. The project achieved LEED-CI v3 Gold certification in May 2017.